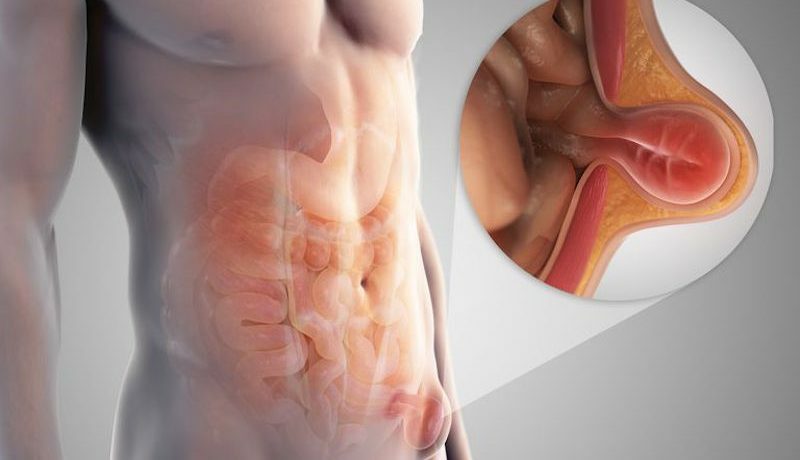 Inguinal hernia is one of the types of hernia, which occurs when a soft tissue or inner layer of the abdomen weakens and then protrudes, bulges or tears. This condition affects almost 27 percent males and just 3 percent females over a lifetime. Inguinal hernia surgery costs around $2000 in India, it may cost around $9000 in the UK and the US. The difference remains significant in case of laparoscopic hernia repair surgery cost as well. It costs around $1100 to repair hernia using laparoscope in India, while the same procedure costs around $7200 in the US and the UK. It typically affects the groin area, when a part of bowel muscles weaken and protrudes through the abdomen and into the groin. In this, either the bladder or the intestine protrudes through the inguinal canal in the groin area of the human body. There are several other types of hernia as well, including hiatal hernia, femoral hernia, muscle hernia, epigastric hernia and incisional hernia. However, inguinal hernia accounts for over 80 percent of all hernia cases. Inguinal hernia may appear when there is a opening in the abdominal muscle wall. This condition can either be inherited from the parents, be present at the time of the birth or appear later in life because of strenuous activities such as weight lifting, weight gain, chronic coughing or a muscle injury. In case, this hernia is present at the time of birth, the symptoms may appear only in adulthood. Different types of inguinal hernia repair procedures in India are performed in several hospitals across the country. The doctors make their decision of conducting a specific procedure based on the severity of the symptoms and the types of hernia that the patient is suffering from. Typically, there are two techniques of treatment in India, differentiated according to the technique used to isolate the bulge. Open technique: Also known as herniorrhaphy, this is the traditional inguinal hernia repair technique in which surgeons cut open the site of hernia to isolate it. Either local anesthesia, general anesthesia or a combination of both may be given to number the area or put the person into sleep during the procedure. During this procedure, the hernia is put back into its original locations before stitching the abdominal wall. An additional procedure called hernioplasty is often performed at the same time. In this procedure, a synthetic mesh or a screen is added to strengthen the weakened muscle wall. Laparoscopic technique: This surgery is also performed with the help of a device called laparoscope. It is a special device with the tip of the size of a fingertip that has a light lens attached to it. It helps guide doctors remove hernia effectively, without the need to make a large incision. Laparoscopy has several advantages over inguinal hernia repair using open surgery. It is suitable for overweight individuals and for patients with hernia on both the sides of the abdomen. In addition, it has less recovery time and the patient can return back to normal routine within two to three weeks. Top hospitals for inguinal hernia repair in India make use of the most advanced techniques that help reduce duration of hospital stay and expedite the recovery rate. In addition, India boasts its brigade of skilled technicians and surgeons that expertise in handling the patients carefully and skilfully. The inguinal hernia treatment cost in India is far less than what it costs in other developed countries, including the US and the UK. The less cost of inguinal surgery attracts a lot of patients from around the world, also because of the reason because the hospitals in the country offer same level of care, expertise and technology as in any other country with expensive procedure cost.